Celtics come up with a big win over the Derrick Rose-less Chicago Bulls as they win 95-91. 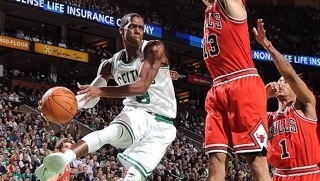 Rajon Rondo led the way for the Celtics as he had 32 points, 10 rebounds, and 15 assists. His constant pace pushed the Celtics to 33 fast break points as he controlled the flow of the game. Rondo played with an attitude that hasn’t been seen for the last few games as he really took it at the Bulls. I couldn’t tell if either he had been ripped into by Doc after the last game or if he was really offended that Rose wasn’t playing. It almost seemed as to Rondo that playing against the likes of C.J. Watson and John Lucas was insulting to him and he was punishing the Bulls for it. Celtics continued their 3-point shooting woes as they went 3-13 from the field, but hit two huge threes in the fourth quarter to keep the Bulls at bay. Maybe not in the best interests of the Bulls, but with Rose out Watson and Lucas shot the ball 32 times. After Luol Deng had 21 points and 16 rebounds in the first game he was held to 10 points and 5 rebounds. The Celtics will look to make it 2 in a row as they take on the Pistons on Wednesday at 7:30. Extra Notes: Derrick Rose missed his second straight game with a sore back; Brandon Bass is going to be out until all-star break with a sore knee; Stiemsma played only five minutes but had a major impact as his block led to a Rondo And-1,but he was shafted on the high five with Rondo; Keyon Dooling played after missing the last 9 games; Rondo tried to turn the Celtics into the east coast version of lob city last night by throwing alley-oops to both Jujuan Johnson and Chris Wilcox. Avery Bradley Alert: Bradley played eight minutes, great defense on C.J. Watson who kept forcing up bad shots during the time Bradley was in. Bradley shot 2-4 from the field for 4 points, had 1 block, and two rebounds. This entry was posted in Celtics and tagged Alley-oop, avery bradley, boston sports blog, Bulls, C.J. Watson, Carlos Boozer, celtics, Chris Wilcox, Derrick Rose, Doc Rivers, Jujuan Johnson, Luol Deng, rajon rondo by leibo4. Bookmark the permalink.